There are lot of the Business Person in India which are registered under the Servicer Tax Registration but they don’t know about its Annual Compliance so in the previous article we talk about the Due Dates of the Service Tax Returns in 2016 but Today we also discuss about How to File Service Tax Return Online in 2016. Service tax is an indirect tax which is imposed on services provided. Service means any activity carried by a person for another for some consideration. This person can be individual, Hindu Undivided Family, Company or a firm etc. i.e. when someone does work on others behalf or assists another in any professional assignment or provides any intangible benefits. Service tax is governed by the finance act as there is no separate act on service tax. It is levied on the value of services rendered. Service tax was introduced on 1 July 1994 at the recommendation of Dr. Raja Chelliah Committee Report on Tax Reforms. In starting service tax was introduced on 3 services only i.e. Telephone Services, Non-Life Insurance Services and Stock Brokers’ Services. From 2012 new concept of negative list regime has been introduced. Due to this regime, all the services are liable to pay taxes except if mentioned in the negative list (as per Section 66D of the Finance Act, 1994) or specifically exempted. For 1 October to 31st march due date for the return is 25 April. 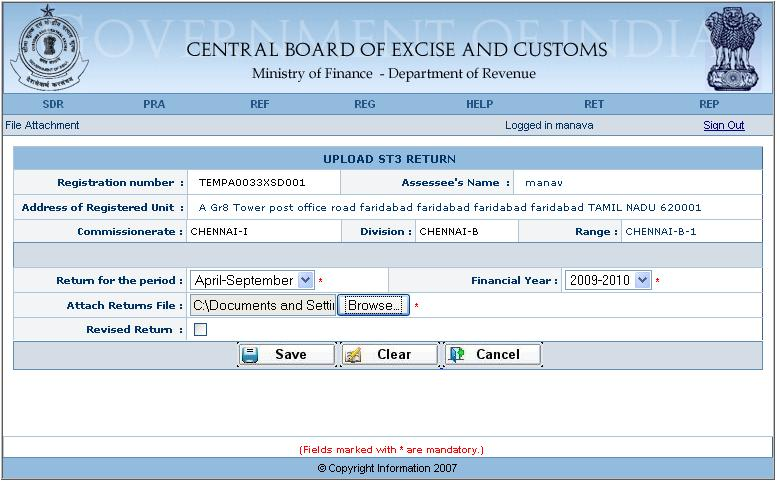 With effect from 1 Oct. 2011, all assesses, irrespective of the amount of service tax they have paid during the previous financial year, are required to file their return electronically. It has been made mandatory by Notification No. 43/2011ST Dated 25.08.2011. Service tax is chargeable when the services are rendered. However, it may be charged with rendering services or after completion of services. We have to see both timing and rate of chargeability of service tax. Chargeability arises when services are rendered. The rate is determined at the time of payment by service receiver. For example, when services are rendered the rate is 10.3% and when the receiver made the payment the rate is 12.36%. Here the applicable rate is 12.36%. However, if the services rendered are exempted under negative list, even if the rate is 12.36% no tax will be payable as chargeability does not arise at the time of rendering services as services provided were exempted under negative list. 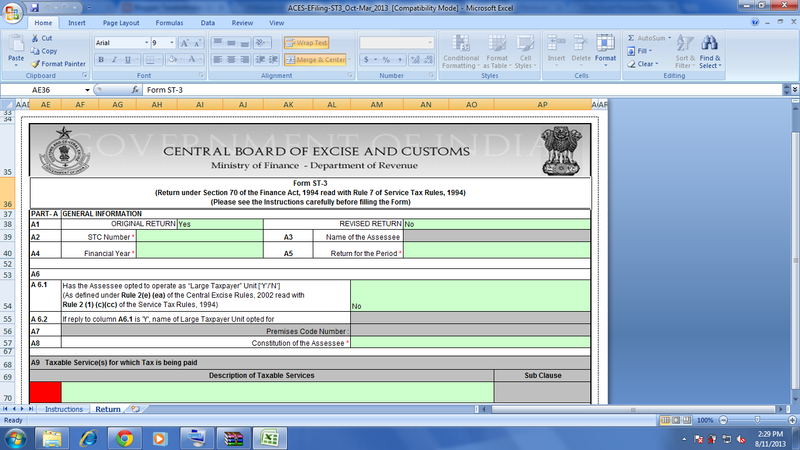 Assesses has to get registered to ACES (Automation of Central Excise and Service Tax). He has to fill the “ACES Declaration Form” deposit it with the concerned Range Superintendent. You have to ensure that fill details correctly of email id as TPIN (Temporary Personal Identification Number) and password will be communicated to this id. When TPIN and password are received you will have to visit official ACES Government Website and click on service Tax on the page to log in. Login to the website by providing TPIN and password. When you will log in for 1st time then you have to change password mandatorily. The only password can be changed and not TPIN. Set a new password. For subsequent login just enter the User id and password as set above. Under the “RET” click on fill option of “fill ST3”. Premises code and address of registered premises of assesses will appear on the page. The code will direct to a hyperlink which will prepare the ST3 return. File the return and then click on the “save”. This will lead to confirmation page of the return. If you wish to amend the return click on Modify and save the return after making amendments. Return to department and press “submit” to submit your return. Successful submission of return will provide a confirmation by displaying the unique no. for such return. After submission return can be revised once in 90 days by clicking “revising ST3”. Visit ACES page and click on “download” and excel utility will be downloaded by clicking “download ST3 Return Excel Utility”. Use this excel utility to prepare the return and click on “Validate & Submit” to generate XML file. Save the file. Login into ACES by providing TPIN and password and go to “RET” menu and then in the option of ” E-filing” and then on the “upload File” option. Save the return by hitting “save” and then to “Submit” to file the return. Upon successful uploading of Return Confirmation will appear but without any unique no. To view the status of Return click on “RET” and then go to the option of ” E-filing” and then click on “View Status”. The status should show “Filed” so as to be considered filed on time if filed on or before the due date. Hope this article helpful for you and guide to you on How to File Service Tax Return Online. So its a very easy procedure with the government user friendly ACES Portal. if you need Professioanl Services regarding the filings of your Complicated Service Tax Return then place a request on MyOnlineCA.